Globally there is intense effort to prevent critically endangered species from becoming extinct in the world. 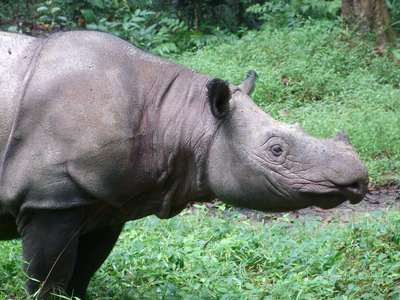 One of the most prominent biological families under threat of extinction is the Rhinoceros, and the most endangered Rhinos live in Indonesia, but thus far conservation funding and government focus have failed to ensure that these species survive. Check out SIES's blog for a detailed analysis and conservation strategies. ​To assist global conservation efforts SIES is developing a system for Automated Identification of Individual Rhinos. We are working with several conservation partners headed by Global Wildlife Conservation. Born 12 May 2016 in Sumatran Rhino Sanctuary to mother Ratu. 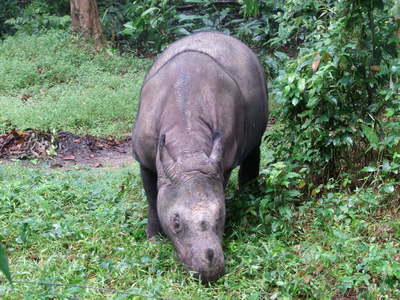 Researchers believe that there are only 68 Javan Rhino and 80 Sumatran Rhino (Dicerorhinus sumatrensis) alive today. SIES is working with global partners to develop an Automated Identification System, improving protection capabilities, and informing strategies. Anti poaching rhino patrol units have prevented poaching but rhinos desperately need suitable habitat and food sources. Rainforest habitat in the national parks are severely degraded by logging last century and ongoing anthropogenic fire. In Way Kambas National Park (WKNP), a quick survey of elephant, tiger and rhino distribution, conducted in 2008 in a collaboration between Way Kambas NP, Rhino Protection Unit, Tiger Conservation Program and the Wildlife Conservation Society, showed that rhino population had retreated to areas in the centre of the park with dense rainforest habitat and canopy, and were not seen in degraded areas. If the rhino population is to expand then the parks requires extensive habitat regeneration with projects incorporating long-term protection. The WKNP regeneration project, commenced 2011, consists of broad scale, long term projects aiming to regenerate and protect areas which were previously inhabited by rhinos, but for many years have been degraded by fire. The project uses fast growing fire resistant species to accelerate canopy development and diminish susceptibility to devastation by fire, and plants rhino food trees, to create suitable habitat for rhinos.